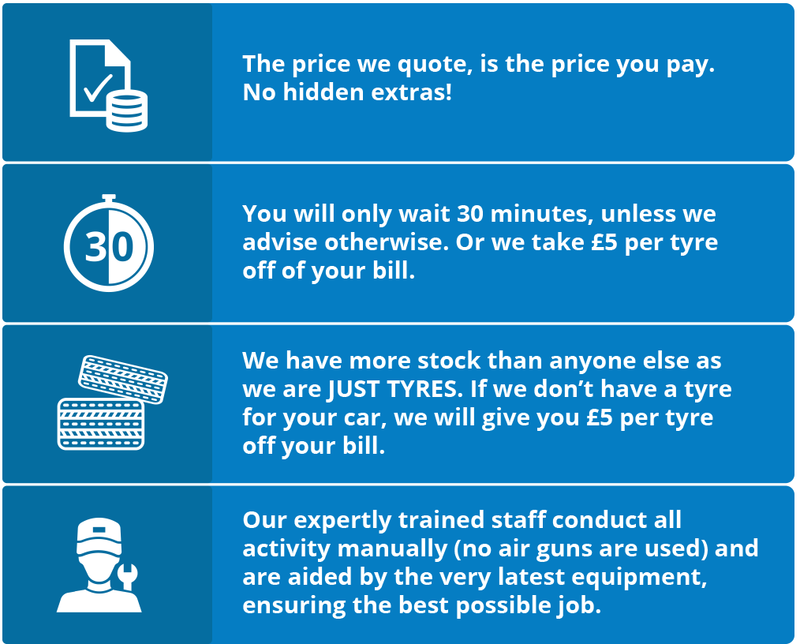 At Just Tyres Crawley we only stock tyres and our aim is to provide you with first class tyre fitting and a wide choice of tyres. We have products available for cars, vans and 4x4s, so it's never been easier to find a tyre that fits your vehicle and suits your individual driving requirements. Our Crawley tyre fitting centre is on the Forgewood Industrial Estate on Gatwick Road, is easy to find and has parking for your convenience. If you are looking to buy tyres in Crawley then come along and have a chat with us, we can offer advice and assistance and carry out a FREE tyre check. If you would like to buy your tyres online and have them fitted by us, just click on the Buy Online image and book your fitting day and time during checkout. Every tyre we sell comes with a 5 year guarantee against manufacturing defects. Activating your warranty is easy and you only need to keep your original invoice, and then bring it back to the Crawley tyre fitting garage for six-monthly checks. A member of our team will test the tyres and complete the details on the warranty certificate. We check pressure, condition, tread depth, wheel balance, alignment and tyre rotation. We're concerned about tyre safety and your personal safety, which is why we always hand tighten and torque nuts to avoid damage to the wheel, rather than using airguns which often leave the nuts over-tightened. To ensure we're continuously meeting our clients' needs, we have a lowest price guarantee. This allows us to refund the difference on a tyre bought from another garage at a lower price (within a 20-mile radius of our Crawley tyre fitting centre). You must bring us a written quote or a printed advertisement within 7 days of your purchase, while internet quotes are not permitted. Our brands are put into four different categories, and we now regularly supply super value, standard, premium, and super premium products. You can learn more about our extensive stock list by emailing us, or calling us on01293531578.